When working on the Homegoods team I designed assets used for their social channels. Most of the posts were used to promote upcoming store openings or used to engage with members/followers of the brand. Rue La La the e-commerce website focuses on selling luxury brands for an affordable price. I worked on these videos to increase engagement and drive Rue's followers to shop our lead events currently on site. 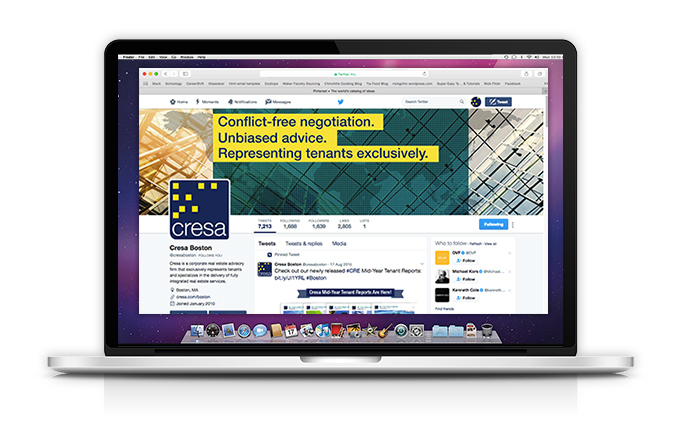 Cresa is a commercial real estate brokerage firm that focuses on Tenant representation using strategic approaches. As a designer I created imagery that supported the content provided by the Marketing Director and Brokers. The imagery was to engage with followers and add a fun personality to the twitter account. To view some of the social posts I created please scroll down.